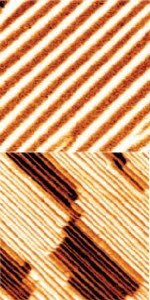 These nanoscale images of bismuth ferrite thin films show ordered arrays of 71 degree domain walls (top) and 109 degree doman walls (bottom). By changing the polarization direction of the bismuth ferrite, these domain walls give rise to the photovoltaic effect. 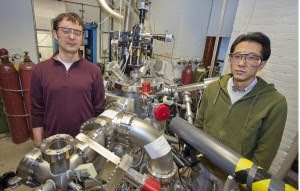 Jan Seidel (left) and Seung-Yeul Yang were the lead authors of a paper describing a new mechanism for the photovoltaic effect in semiconductor thin-films that overcomes previous bandgap voltage limitations.